When you read a book you probably use some sort of bookmark that will help you find the place you finished reading last. Folding down the corner, a piece pf paper or card, a special ornamental plastic that clips onto the pages, or a sticky coloured plastic. Whatever you use you find it necessary because we cannot always remember exactly where we left off. When we use a computer or tablet or such like we need something to help us find where we were last so that we can easily return to that place. 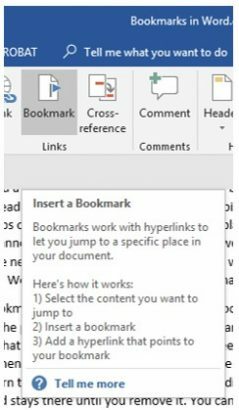 MS Word has such a feature called ‘Bookmark’. 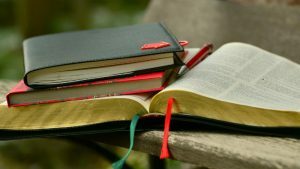 Unlike the bookmarks in books, papers or Kindle, the Word bookmark takes you to exactly the word you read last not just the page. You can also use these bookmarks to help others who read your document to quickly go to that place, missing out the stuff in-between. When you edit a document and not finish it, then save and close it, the next time you open it Word automatically gives you the option to return to the point at which you were last editing. This is not a bookmark. A bookmark you create in Word stays there until you remove it. You can have several bookmarks in one document. Here is an example four-and-a-half-page document. Highlight the word you need to come back to. 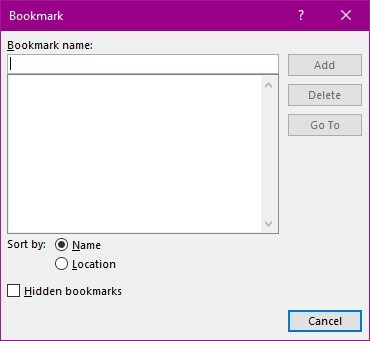 This tool helps you create the bookmark. When you select the tool this dialog box appears. Type a one-word name for the bookmark. This can be repeated as many times as you wish. 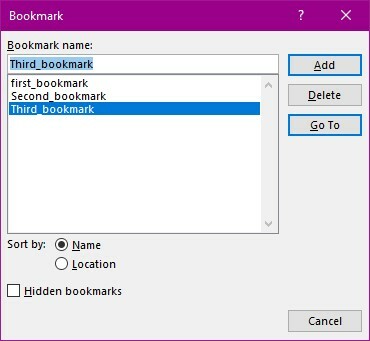 To return to a particular book mark select the Bookmark tool. It will display all the bookmarks you have created for this document. Notice that I have used an underline between the two words that make this name a one-word name. Double click or select the bookmark of your choice and select the Go To button. 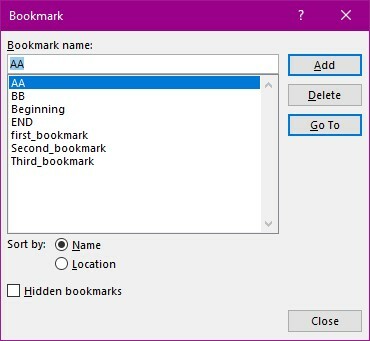 If you have created a large number of bookmarks you can search by name or location (location order in the document) to make your life a little easier. It is, however, important to give meaningful names to your bookmarks so that it makes this task easy. 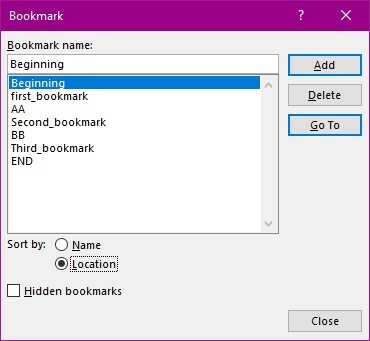 A list of bookmarks in name order. The same list but in location order.